Reversed: Alignment, personal values, overwhelmed by choices. In the Seven of Cups, a man stands before seven cups filled with various gifts. Some cups bear desirable gifts such as jewels and a wreath of victory. But others hold gifts that are not gifts at all; instead, they are curses, such as the snake or dragon. 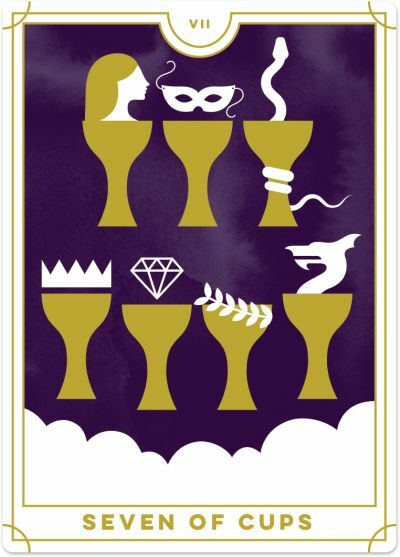 The clouds and the cups symbolise the man’s wishes and dreams, and the different gifts inside suggest that you need to be careful what you wish for as not everything is as it seems. Choices need to be made, but in doing so, you must go beyond illusion and allure, and instead focus on what’s right for you. The Seven of Cups is a card of new opportunities, choices, and at times, illusion. When the Seven of Cups appears in a Tarot reading, you have many options and opportunities from which you can choose. But be careful! You are prone to illusion and unrealistic ideals. An opportunity with promises of more money, more fame, or more power may sound appealing, but as you look deeper into what is on offer, you may realise it’s not everything it’s cracked up to be. Your ego may pull you in a specific direction, but it’s important you check in with your Higher Self first. Evaluate your options and dig below the surface to discover what’s involved with each choice. Often, the Seven of Cups can be a sign of wishful thinking and projecting into the future about what you would like to create, rather than taking action here in the present to make it happen. For example, you may wish for a fitter, more healthy body, until it's time to get out there and exercise. Or you might wish for a successful business fuelled by passive income, but you’re not ready and willing to put in the hard work now to enjoy the fruits of your labour later. If you spend most of your time wishing but not doing the work, then it’s time to choose just one thing and make it happen. You may find that your ideas are not grounded in reality. Your plans might sound fabulous in your imagination, but when it comes to implementing them, you may realise they do not work in the real world. The Seven of Cups may be a sign of ‘shiny object syndrome’, where you keep finding the ‘next big thing’ but fail to see any of those new opportunities through to the end. When you are constantly in the idea phase, you miss the chance to bring your designs into fruition. Again, now is a time to focus on the one thing that will move you closer to your goal; resist the temptation to get side-tracked with other ideas as they arise. If need be, note your ideas as they come up, but stay focused on the one thing you’re doing. This card is inviting you to move out of the ideas and options phase and choose. Each will have its pros and cons – it’s up to you to make sure that the option you select is in alignment with your purpose and your Highest Good – even if you feel somewhat paralysed by the options available to you. The reversed Seven of Cups often appears when you face several different choices and, instead of choosing the option that may appeal to others, you are relying on your inner wisdom and guidance to show you the best way. You may come up with your own criteria to help you make decisions in alignment with your inner being. If you find yourself with multiple opportunities or ideas, ground yourself first and reflect on what you want for the long-term. All these shiny new objects in front of you have a certain ‘magic’ power over you right now, and you’re at risk of losing focus if you chase after pipedreams. Take a step back and assess the options against your priorities to work out which opportunities will be a real benefit to you. As a card of choices and options, the reversed Seven of Cups can mean you are overwhelmed by choice and cannot move forward. Reduce your options and focus on what is important to you. You don’t need to keep searching for that big idea; you have what you need. Make your pick and move forward with it.